Looking for a fun and tasty brunch (or snack) idea? 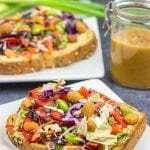 This Thai Peanut Hummus Toast is easy and packed with flavor! Using a small mixing bowl, add rice vinegar, soy sauce, lime juice, honey and garlic; whisk until smooth. Add the peanut butter, salt and red pepper flakes; whisk until smooth. Using a large bowl, combine all of the ingredients; mix until well combined. Top with ~⅓ cup of Thai Peanut Mix and drizzle with Thai Peanut Sauce. You'll have a lot of leftover Thai Peanut Mix to make more hummus toast! I prefer Sabra’s plain hummus for this toast, but other flavors could work as well depending on your preference. Instead of slicing your own cabbage and carrots, you can use a bag of cole slaw mix without the dressing.